Super Cooler Neck Tie Coolers Super wide body cooler for super relief from the heat. Super Coolers are the best personal body coolers to wear around your neck to keep you cool. These body coolers are 5cm wide. 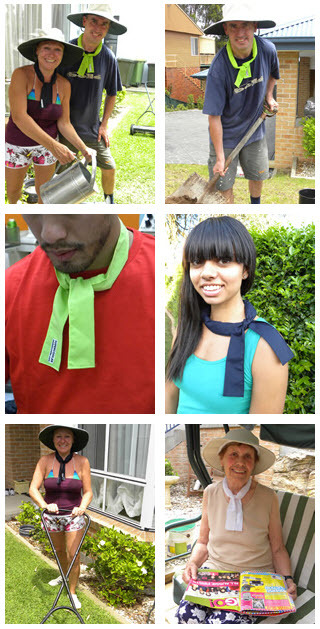 Super Neck Coolers cool you down after a hot workout, bike ride, or mowing the lawn: in fact these super cooling neck wraps will keep you feeling cool and refreshed doing anything, anywhere, anytime. Super Neck Coolers are the environmentally friendly, carbon free way to improve work productivity because that cool refreshing feeling of a neck cooler around your neck will make work less heat stressed and play much more enjoyable. Super Coolers can be worn around your forehead as a cool bandana. Should you be working with machinery, or in an environment where the ties may get entangled, it is recommended that you use the Cool N Safe Neck Cooler, which is the same width but has a Velcro closure, so there are no ties hanging down to get caught in any machinery. When you open your Super Cooler, you can feel the crystals in the pocket of the sleeve. Take your hand and spread the polymer crystals out evenly throughout the neck cooler pocket and place in cool water. The magic water crystals will grow holding up to 400 times their original volume of water. Let the neck cooler soak in the water for about 10 minutes. Remove your Super Neck Cooler from the water and squeeze out the excess moisture. Wear around your neck and tie loosely. Your arteries are closest to the skin in this area and this will assist in cooling down the blood to your head reducing that overheated feeling. Keep the fabric moist and the water will evaporate from the crystals slowly giving you a cool refreshing feeling. Re-activate as needed. Simply immerse in clean water for 10 minutes. Crystals will re-hydrate for years. Keep your Super Neck Cooler in the fridge till you need to use it again. Don’t leave your body cooler soaking in water though as the crystals will keep expanding and it will turn hard and you will not be able to place it around your neck. If this occurs, you will need to hang it on the line in the sun until it softens again.